I am reminded of a line from my favorite comic series of all time, Starman - a line spoken by Oscar Wilde as he visited America. "I've found there is much to admire in America. However, on closer examination, I find that everything admirable has been imported from somewhere else." That is Into The Dalek in a nutshell. There are good elements to this episode but almost all of them have been stolen from other, better Doctor Who episodes. Capaldi does a fine job trying to sell it but even he can't fight the inertia that keeps this episode from going anywhere. En route to meet Clara for coffee, The Doctor slows down long enough to rescue soldier Journey Blue from The Daleks and return her to her ship. Faced with a death sentence for invading their secure facility, The Doctor is temporarily spared so that he can tend to a patient captured by the soldiers - an injured Dalek who has somehow developed a capacity to appreciate beauty. Can a Dalek be reformed? The Doctor is skeptical but it's a question he'd like to answer. Much as he would like a solid answer to a question that has apparently consumed him since his regeneration - Am I A Good Man? * The opening scene before the credits is a good one and Peter Capaldi's talking down a soldier by firmly and politely (but with a bit of sarcasm) insisting that he will not be talked to in terms that involve orders or do anything because a gun is pointed at his head is perfect. We're still getting a feel for this new Doctor and this is a great scene which lets us know that this is not a Doctor who suffers fools gladly but neither is he actively cruel towards them. * Cliche as the "being-shrunk-and-going-inside-something's-body" troupe is (Classic Who already did it with The Invisible Enemy), the idea of exploring a Dalek from the inside is interesting enough and the Dalek Antibodies are delightfully sinister. * The line "I AM NOT A GOOD DALEK. YOU ARE A GOOD DALEK." is a great one, though it was shamelessly cribbed from the Series 1 episode Dalek. If only Daleks had thumbs, so that Dalek could give The Doctor the snaps before rolling off. * If Deep Breath was Steven Moffat stealing from his own stories to create a "best of" Doctor Who episode, then Into The Dalek is Moffat looting the rest of the series' history. Virtually every element of this episode has been utilized before and utilized far better in other Doctor Who stories. An exploration of The Doctor being no better than his worst enemies morally? Dalek from Series 1. The Doctor's bias against soldiers for what they represent? The Poison Sky and The Doctor's Daughter from Series 4 The concept of a broken Dalek turning good? Moffat's own Asylum of the Daleks from Series 7! I could go on, but I think that's enough to make the point. * Granting that the series has always had an anti-authoritarian vibe and The Doctor has never had much use for military thinking in general, a lot of the anti-soldier talk here seems a bit over the top. I can see what the writers are going for, drawing parallels between the human soldiers, The Daleks and The Doctor all being united in their common hatred and refusal to question the efficiency of that hatred. But what they are trying to say and what they actually say are worlds apart in content and tone. * The soldiers on The Aristotle are remarkably shallow even by the standards of soldiers in a Doctor Who story. Journey Blue in particularly is woefully underwritten and could have benefited from some of the time used to develop Danny Pink. And don't think we didn't notice the feminine/masculine colors being used as ironic contrast to the characters and their roles with Blue being a female soldier and Pink being a male teacher. * I challenge every Rose Tyler hater out there who has dismissed her character as the biggest Mary Sue in history to watch this episode and make a convincing case that Clara Oswald isn't much worse in that regard, as we see an ordinary school teacher start crawling around inside a Dalek's brain and start pulling random things to unblock its memories without getting electrocuted. 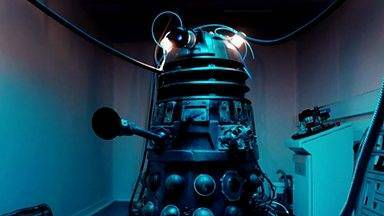 Uninspired and a little bit dull at points, Into The Dalek will serve only to remind the fandom of stories that utilized the same story elements far more effectively. Quite possibly the most generic Doctor Who story ever.